I've been photographing my city for a couple years now. It provides no end of interesting subjects. And although I know I'm overly familiar with it, I always come away with fresh views caught in the lens that I hadn't anticipated. The image above was taken the other week, and although I've longed to photograph this subject really well for such a long time, THIS time it finally seemed to work. 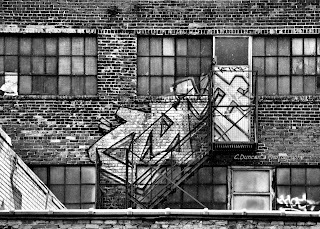 I looked at this familiar scene, and realized that I had all the right elements... great light that day, a light rain added a grainy affect, I had my tripod (which I normally won't take downtown since it screams "lone woman wandering the streets with expensive equipment") which allowed me to tighten and straighten a better crop than handheld, and good position. Whew. Needless to say, I was excited to convert this image to B&W and see how gritty and truthful an image it was. "Berenice Abbott is a photographer who is exceptional in her determined avoidance of subjects whose inherent interest - their unfamiliarity, their bizarre nature, their startling juxtapositions, their exceptional beauty- would arrest the observer's attention even without the benefit of isolation and emphasis a good photographer can supply. An artist whose eye is the super-eye of the camera." When you view her work this is very evident. "Images unmodified by tricky exposures, eccentric and overused angle shots, removed from any clever device." and it motivated me to spend the day exploring my own city as she had, documenting much of it just the way it is, exploring the familiar. What part of your passion do you need to re-explore today? When I first began really putting my roots down in the photographic community, I was so green it wasn't funny. In fact, in a lot of areas I'm still pretty green... but I'm okay with that. Everything will come in good time. I started out being certain of three things though. 1) That composition was my strong suit. I had come from a background in fine art, and elements of design had been ingrained in me at a very early age. 2) That I loved the classics. 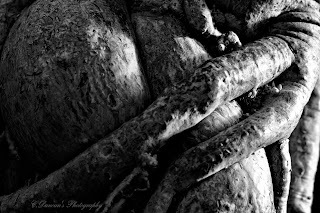 B&W photography to this day moves me in ways that color, digital composites, and manipulated abstracts never will. Not that I don't admire many photographers that can blow me away with their Photoshop skills, and not that I don't shoot in color (cause I do, obviously).... it's just not the same for me as a dynamic B&W. 3) That I couldn't wait to show the world what my world looked like through the lens. The above photo may not be perfect (don't look too close eh, just trust me. It's not, lol) but from all my images in the past two months, it most accurately reflects THIS photographer. I almost didn't post it. Which is wrong, cause I love it. And you may not agree with all of it's qualities but I'm down with that. That's why I love photography in the first place! Over the next while you'll see me referencing some of the greatest photographers of history, mainly because it's important to recognize who's images and styles you relate to... not just the latest editing trend (and some of them are SO cool... but again, they aren't quite for me). These will be people who left their mark, their style is very unique to them. Influences, and inspiration are great I think as long as it emphasizes who you already are! So hey, if digital darkroom is totally your thing, then go for it. If you only enjoy shooting with your iPhone, then do it! If you love, love, love film and refuse to switch over to digital, then that's who you are! And for the most part, stay true to it. Show everybody who you are.